Arrange biscuits on baking sheet. Press the bottom of a 2 1/2” cup into the center of each biscuit, creating a “nest”. Mold dough around the glass as needed to create a deep indentation surrounded by even edges. Bake for 10 minutes, remove pan from oven. 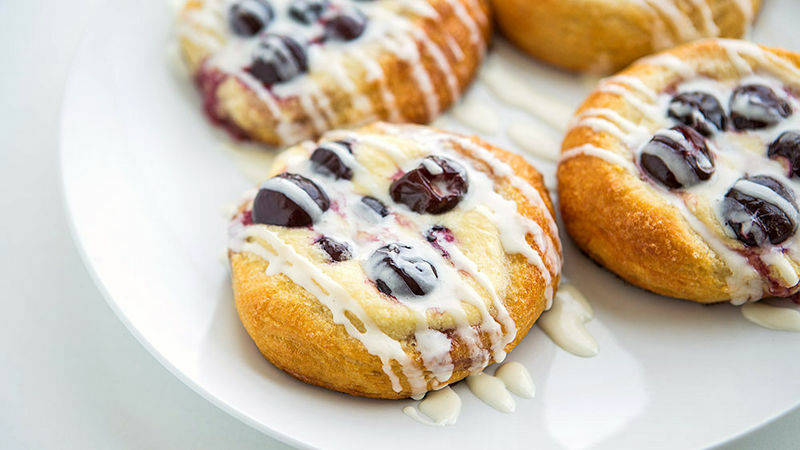 Place cherries on top of cream cheese, return to oven and bake an additional 10-15 minutes, until the edges of the pastry turn golden brown. Remove from and cool completely. In a small bowl, melt frosting in the microwave and stir in almond extract. Drizzle over cooled pastries. Use blueberries, raspberries or blackberries instead of cherries to make a variety of flavors.